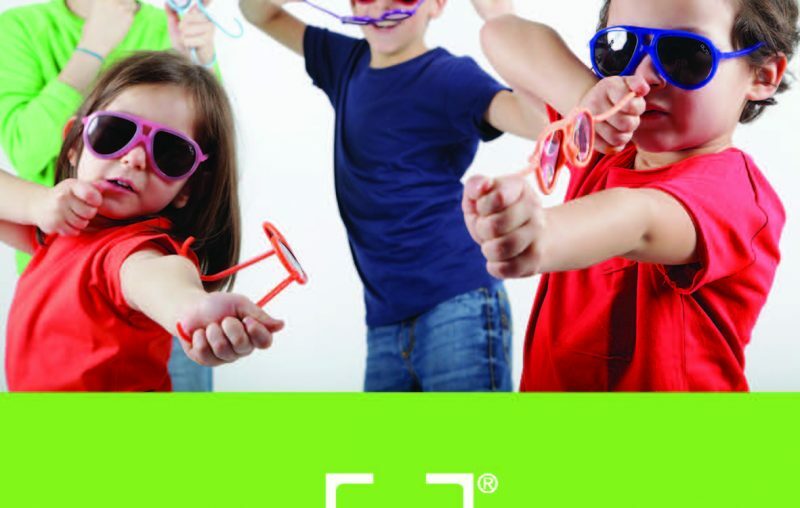 Zoobug frames are different to other kids eyewear because Zoobug do not scale down an adult version. Each style has been carefully designed and tested just for kids. Packed with features such as polarized lenses, fits for Asian noses and detachable headbands for babies. As much work, if not more, goes into making a pair of Zoobugs as an adult designer frame. As for the kid sunglasses, Zoobug also design and create up the sunglasses just specifically for children size and need. Why do children need to wear sunglasses? Protecting young skin from the sun has become second nature for most parents, but not so when it comes to eyes. The message is not getting out there but eyes too can get sunburnt, a condition known as photokeratitis. Over-exposure to ultraviolet light, such as a day at the beach under very bright sunlight or on the ski slopes without proper eye protection, can cause a painful burn to the surface of the eye (cornea) - similar to sunburn on the skin. Although the condition is temporary, it can lead to blurring of vision and much distress to young children and requires urgent medical attention. 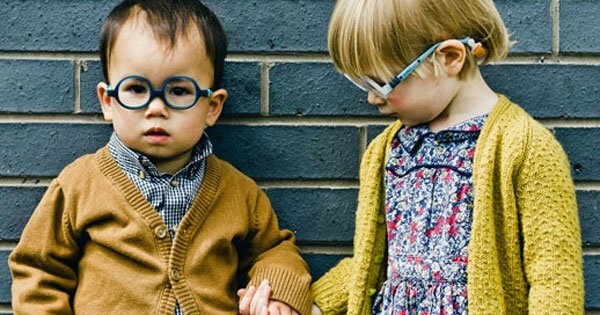 Do children need to wear sunglasses just like adults? 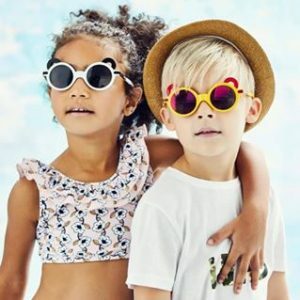 Children’s eyes are in fact at greater risk than adults in the sun especially fair children with pale blue eyes because the UV filtering mechanism within the young human lens is not yet fully developed. Hence, they are ultra sensitive to UV and blue light. So by the age of 18, children would have already been exposed to more than half of their total lifetime exposure. What sort of eye damage can be caused by UV light? The damage starts early and is cumulative leading to increased risks of eyelid cancer, cataract and macular degeneration in later life. How should I protect my child in the sun? It is vital that children adopt good UV habits from the word go. Babies under 6 months should ideally not be exposed to any direct sunlight where possible. If out and about all children should avoid being exposed directly under the midday sun. SPF30-50 suncreams should be frequently applied and if in the water for prolonged periods then UV swim outfits are very useful. A wide brim cap, with a rim of at least 3 inches and cover for the back of the neck prevents burning. Finally a pair of good fitting quality 100% UV protective sunglasses which complies to recognised standards completes the UV safety kit. 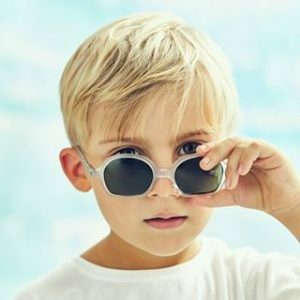 How do I choose the right pair of sunglasses for my child? Every parent knows that persuading a child to wear sunglasses can be tricky especially if they are very young. So make sure the fit, design and protection is there. The style needs to suit the child's activity but also be robust enough and suit their personality so it remains worn. How do I ensure I get a good fitting frame? Make sure the sunglasses fit properly! This is the first vital consideration and will ensure whether or not it gets worn. The fit will vary according to the age of the child and their face shape and is particularly difficult in babies and toddlers because of their relatively flat, wide nose bridges and facial bone structure. When in doubt, seek expert advice from your local optician. Generally, the frame has to sit comfortably on the nose bridge without touching the cheeks and the tips of the arms need to curl over to rest behind the ears. This is essential to distribute the weight of the frame evenly across the face to prevent pressure sores and the sunglasses from sliding off. Built up or lowered bridges and adjustable side arms are very useful features for all active children as are attachable headbands. How can I tell the quality of a pair of sunglasses? The second consideration is the quality of the lens to ensure adequate eye protection and maintenance of good visual development. Lenses need to be at least 99% UV protective as well as provide high optical clarity. Polarised lenses cuts out glare and gives crystal clear images in very bright hazy sunshine and are ideal on the water or snow. Beware that whilst some sunglasses claim to provide 100% UV protection, their lenses may not be true lenses, instead are cheap pieces of plastic coated in a UV film. Good optical clarity in a true lens is essential for seeing clear images and hence visual development. One way to test this is to hold the frame at arms length and fixate on a straight line in the distance whilst you move the lens from side to side. There will be minimal distortion with good quality lenses. Is the lens material important and why? Lens material is an important safety factor. Choose shatterproof plastic lenses, this could either be polycarbonate or CR39 lenses which should have undergone dropball testing, an industry safety standard, to ensure it is impact resistant and therefore safe for children and sports wearers. Toy sunglasses should be avoided at all costs as they tend to have sub-standard lenses which may not provide any protection. One way to make sure is to check the label or with the manufacturers that the sunglasses comply to British Standards or other recognised international standards (see below). Remember that a good fitting pair of sunglasses with a high quality lens will always be worn! What is the difference between a budget and true lens sunglass? Cheaper budget sunglasses should be avoided for 2 main reasons: substandard UV protection and poor quality lenses. Firstly, if they offer no UV protection, they will do more harm than good. The dark sunglass lens will cause the child’s pupil to dilate thus allowing more UV light into the eye than blocking it. Secondly, the lenses may not be true optical lenses, but pieces of plastic which have simply been UV coated. There is a big difference since images and colours are not true and crystal clear which is vital for a child’s developing vision. There are many different types of UV labels attached to sunglass lenses or swing tags. Which ones should you look out for and what do they mean? What do the different UV standards and labeling mean? All sunglasses imported into the UK and sold in reputable high street stores should have the British and European safety standard label BS EN 1836:2005/2007. They should block up to 99.99% of harmful UV light. Some sunglasses also comply to the US standard ANSI Z80.3:2001, and the stricter Australian standard AS/NZS 1067:2003. Check for all 3 if planning a trip overseas. Zoobug sunlenses, as a standard are compliant to all 3 international standards. UV400 is another optical industry standard which is an indication of maximum or 100% UV protection as the lens blocks all UV light up to 400nm which includes UVA, UVB and UVC. Does the darkness or colour of the lens have anything to do with the amount of UV protection? UV protection is a coating applied to the sunlens. It has no colour and is clear and bears no indication of optical quality. A poor quality pair of sunglasses without true lenses can still offer 100% UV protection. Parents need to consider UV protection as well as lens quality. A proper pair of sunglasses uses true optical lenses which is vital for children's developing sight. The colour of a lens is referred to as it’s tint and can be grey, brown, yellow, green etc. The darkness of a tint is it’s category which goes from 0 (clear) to 4 (darkest). Therefore a clear sunlens can still have the same strength of UV protection as a darker one and the shade bears no correlation to UV protection. UV protection - a coating applied to the sunlens. It has no colour and is clear. Lens tint - the colour of a lens is referred to as its tint and can be grey, brown, yellow, green etc. For children grey and brown tints are generally recommended. Other coloured tints allow colour enhancement useful for certain sporting activities. Tint category - the darkness of a tint is its category. It is rated from 0 (clear) to 4 (darkest). In children the standard category is 3 for general activities. As a rule the brighter the sunshine, the darker the lens to prevent eye strain. A clear sunlens can still have the same level of UV protection as a darker one. The darkness and colour bears no relation to UV protection. Zoobug quality commitment cover against all manufacturing defects for 18 months from the date been purchased. For any enquiries about Zoobug, please visit Malaya Optical as professional eye care practioner will assist you in protecting your children eye health. Alero children frames are really good as Kids glasses, as this brand will suit your child's needs and functionality. Malaya Optical, established in 1957, is well known to be a reputable and trusted optometrist center in Malaysia. We received many referrals from eye specialists, orthoptist, paediatricians and other eye care professionals.